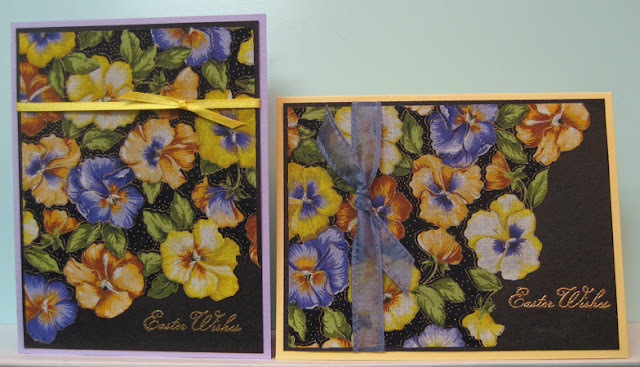 I have had this pansy fabric for a long time and have used much of it for making cards by applying a fusible webbing to the back. I found these two scraps in a box of spare parts I had not been through in a while and thought they would make wonderful Easter cards. I fussy cut the edges around the flowers to give myself room for the greeting on my black background. This fabric does better on a white background because it makes the colours pop where as the black dulls it a bit. None the less I really like the gold embossed greeting (SU) which highlights the gold in the fabric. After embossing the greeting I positioned the trimmed fabric and carefully ironed it onto the background. I had to be careful not to touch the embossing powder because it would have melted to the iron. I added ribbon to the other end of my fabric (yellow on one and purple on the other) and tied on a short piece to the longer length to simulate a bow. I glued the one to a yellow card and the other to a purple card. 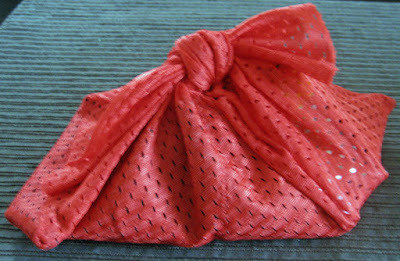 As you can see the fabric is very versatile and can be used in both orientations!!! Very happy with these cards!! I will have to keep an eye out for more fun fabric for my card making! !